The UCREW Committee and the CREW Boston Educational Foundation, serves as a liaison between CREW Boston and young women pursuing education that will lead to careers in commercial real estate. The Committee is dedicated to advancing the success of women in commercial real estate by reaching out to colleges and providing educational programs, networking opportunities, mentoring and career advice. 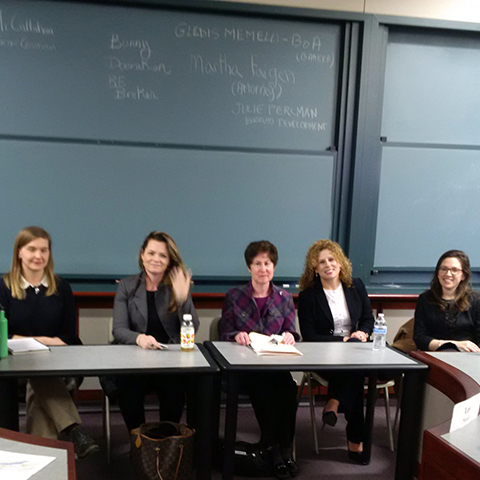 In April CREW Boston members spoke to students at the University of Massachusetts, Boston. The panelists discussed their education, career development, and current position to a small group of business students interested in commercial real estate. Students were also encouraged to apply for the CREW Boston scholarship next year. CREW Boston members spoke to students at Boston University. The panelists discussed their education, career development, and current position to a group of 30 students interested in commercial real estate.